I don't know why I've had the sudden urge to be on this popsicle making kick. It could be that it's too hot in Texas to turn on my oven or it's simply much easier than compiling ingredients to bake a dessert. Here is my latest attempt at making Asian-y popsicles. Koreans love red bean desserts and one of my childhood favorites was a creamy red bean popsicle during summertime. I can't say my version was too much of a success but I did have some people finish their treats (unlike me). And since this blog isn't a fancy blog, I'm here to share this kitchen blunder. If you like beany and coconutty popsicles, these are for you. Next time I would blend the adzuki beans completely since the grittiness from the beans was distracting AND I would opt for whole milk because the coconut milk was also distracting. 1. For a smoother popsicle: add all ingredients into a blender and blend until smooth. Pour into popsicle molds and freeze for at least six hours. 2. 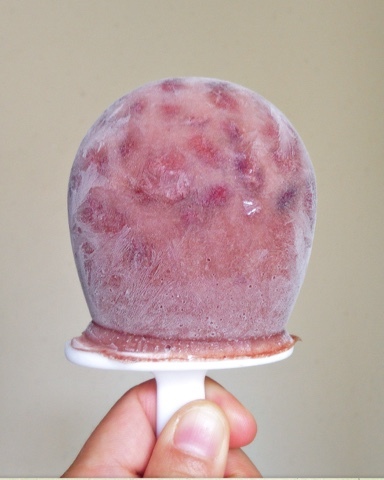 For a chunkier popsicle: add half the beans into blender along with milk, sugar and salt. Blend until smooth. Then stir in remaining beans and pour into popsicle molds and freeze for at least six hours.